The hapless witch with a heart of gold has been bitten by Olympic fever. Now winsome Winnie is raring to go! Throwing parties, saving the planet, minding the baby; she’s zapping new-found energy into everything she does. 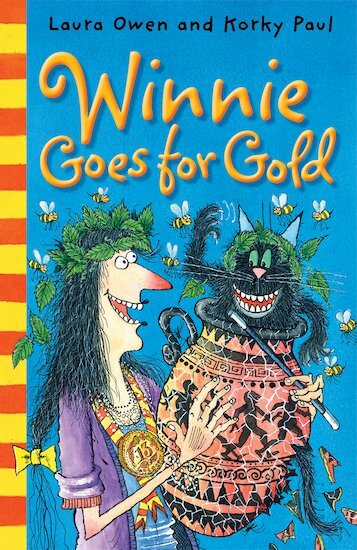 And at the school sports day, Winnie’s wacky magic lets everybody go for gold! The world’s favourite witch takes to the podium yet again in four new stories, brought alive by Korky Paul’s energetic illustrations – and Winnie’s trusty sidekick, Wilbur the cat! This is one of my favourite books. Winnie wakes up and asks Wilbur to make food, but he made too much food. So then she decided to have a party, she made a list but forgot to invite people. Then she began to panic…Read the rest to find out how she sorted out the problem. I think it is funny that Cuthbert has a snereal bowl rather than a cereal bowl. amazing book. great for all ages!